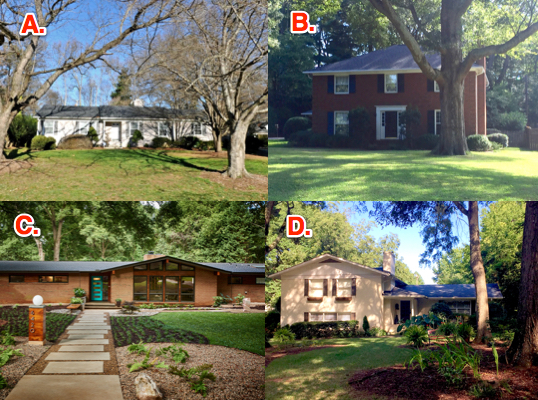 A little quiz….Which one of the four houses below is Mid Century? …. OK it’s a bit of a trick question all four are from the mid twentieth century but only one is mid century modern design (C). It can be a bit confusing especially when you consider the modern movement started in the early 1900s. By 1901 Frank Lloyd Wright had completed over 50 projects including iconic homes in Oak Park Illinois, by 1920 the German Bauhaus movement was in full gear and you know that uber cool “1960s” Barcelona chair it was actually designed in the very un-hip year 1929! So back to mid century modern… If you’re like me you’re thinking hey wait I was born in the 1960s, my parents owned a home but it was nothing like these cool Palm Springs, “Mad Men” houses designed by Wexler, Lautner or Neutra! There’s a good reason for that. Back to our quiz … much like today back in the 1960s there were several popular design styles Art Nouveau, Arts and Crafts had their place but American Colonial was the big one and it rivaled Mid Century Modern. There were and are lots of homes with colonial Ethan Allen dark stained bedroom and dining room sets – sound familiar? You know home decor that was more Gunsmoke than Brady Bunch! 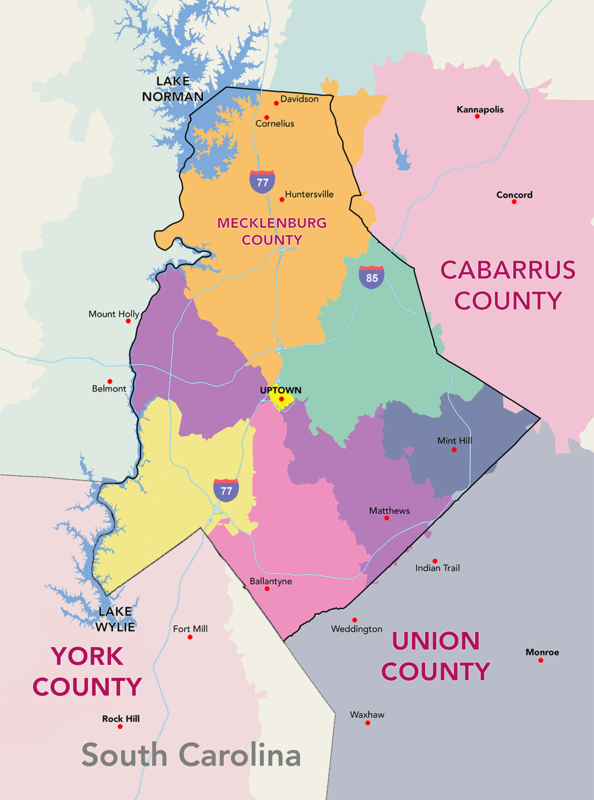 And it also depends a lot on where you grew up while Palm Springs CA is the touchstone of Mid Century Modern, Arizona and Florida had their fare share and then there were odd pockets of Mid Century Modern in places like Raleigh NC, Washington DC, Denver, Austin and the Upper Midwest. You should see some of the vintage furniture found at Goodwills in places like Illinois and Michigan! There’s another factor. You may have in fact grown up in a mid century modern design home but it just wasn’t kept true to the original architectural intent. 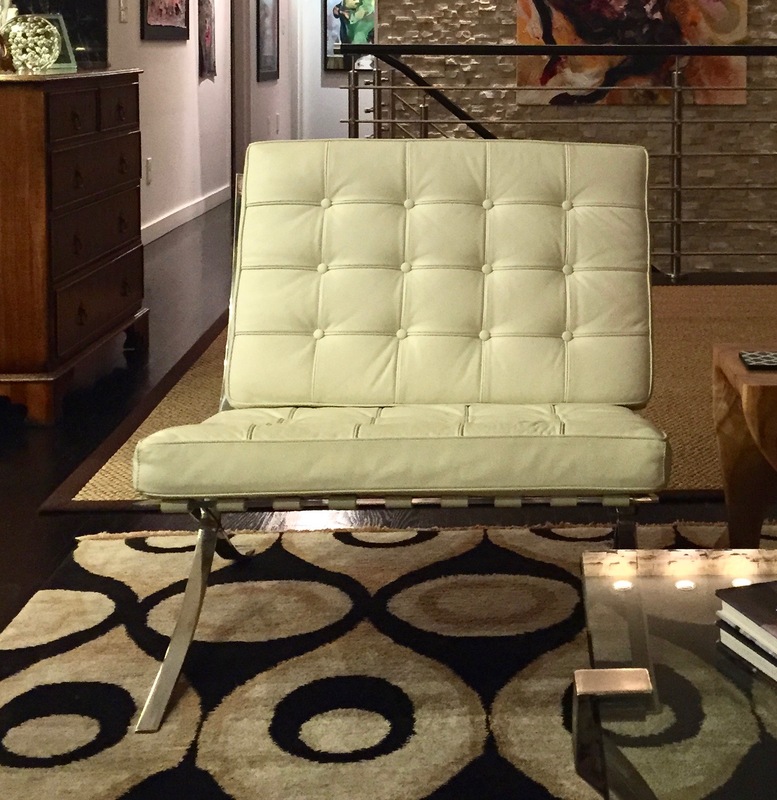 The basic tenants of Mid Century Modern design are 1.Simplicity 2.Functionality 3. Use of natural materials 4. Asymmetrical and angular architectural details 5. shallow pitch rooflines and 6. Bi level living spaces and of course 7. big windows that integrate the inside living spaces with the outdoors and nature. 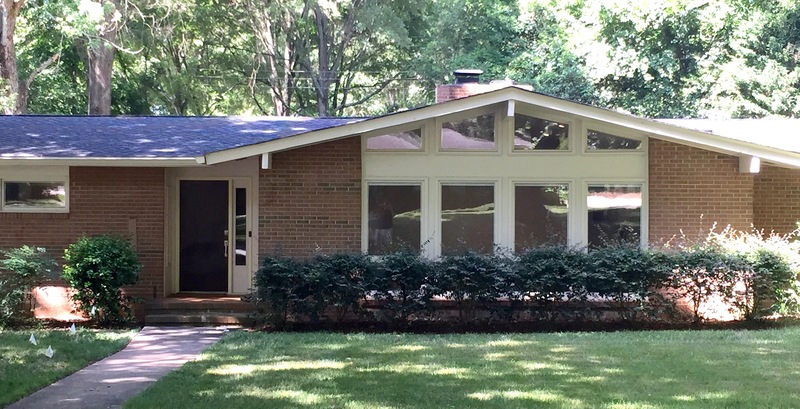 Look closely around Charlotte you’ll see many fantastic Mid Century Modern split levels or ranches that sadly have been de-modernized with full window curtains, added faux shutters, six over six grid windows, solid colonial doors with brass knockers…etc. Nothing wrong with that but if you’re a lover of Mid Century Modern then you shed a tear every time you see it. Here’s are some fairly easy ideas to bring out a home’s mid century modern flair. When Rhonda and I bought our 1963 ranch in Lansdowne we fell in love with the classic Mid Century Modern elements like the shallow pitch roof, floor to ceiling windows and Eichler inspired post and beam construction. 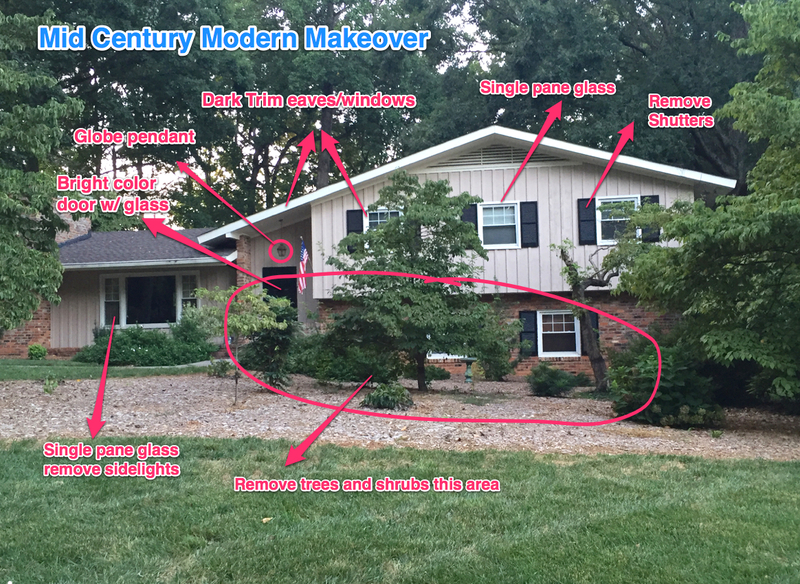 Luckily for the most part the home had been kept true to the Mid Century Modern vision we just had to tweak some things to breathe new life into the classic design. You can see some before and after renovation pictures below and above. The good news Mid Century Modern bones are strong and these homes can be restored to their original simple glory. 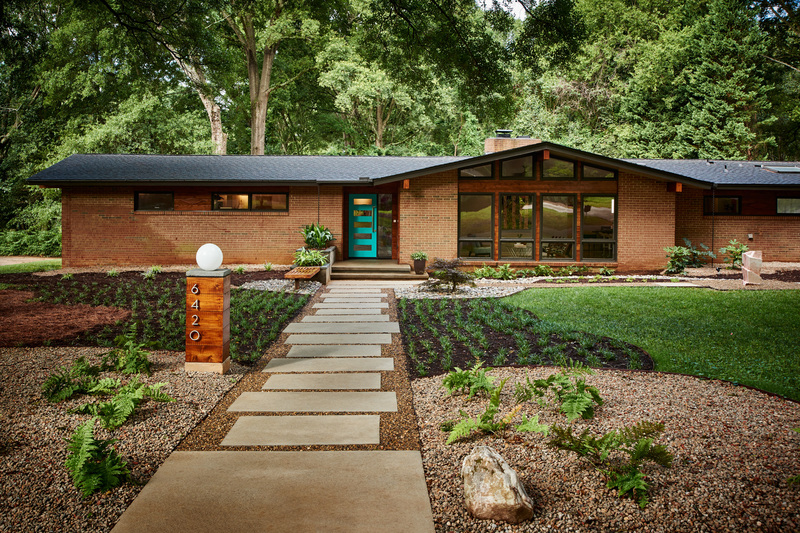 That’s one of the primary goals for Charlotte Museum of History’s Mad About Modern Home Tour to showcase Mid Century Modern design and preserve these gems. We hope you’ll join us for the Tour September 10, 2016 10am-4pm. 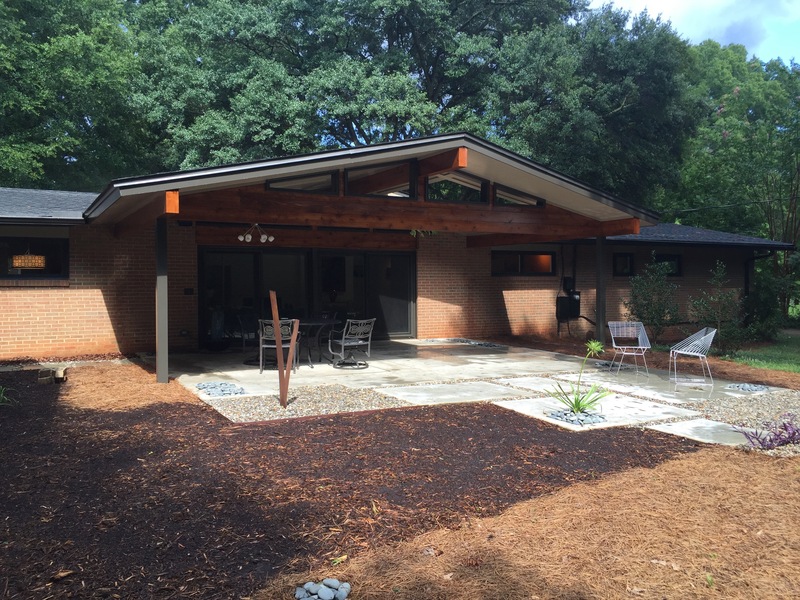 There will be eight incredible mid century modern homes open to tour in the Southpark area of Charlotte. For tickets visit http://www.charlottemuseum.org/events.asp and for more information on the tour or on buying or renovating your own mid century modern gem contact Mike Gibbons iGibbs at mac dot com. Here are a couple of before and after renovation pictures of our 1963 Lansdowne ranch (the After Front is the photo at top of the post)!